The modern street is a pale shadow of its former self, running barely 40yds. The original street ran all the way to Chapman Street (then called Upper Chapman Street) and the railway, some 300+ yds. It has been lost to modern redevelopment. Trade directories have no entries for No 40. It would have been on the West side about halfway between Commercial Road and modern Bigland Street (then called Lower Chapman Street). It is now underneath the Mulberry School for Girls. I've been having a look at the various address & contacts he gives in the WO97 & WO363 sets. Hornblower the grocer. Not 100% sure if it's 42 or 45 Leather Lane which would make sense for a grocer's market plus it's a stone's throw from 12 Beauchamp Street. However, I can't find a grocer called Hornblower in that area for 1901 or 1911. 1901 Census has a Thomas Charles Powell, grocer at 45 Leather Lane. The address itself is a bit odd as there is a 45 Leather Lane and a 45 Leather Lane Buildings with different occupiers. Ditto for 42. 1911 census has Frederick Herbert etc & Sheen family at 42 Leather Lane. There is a Richard Hornblower a grocer in Shropshire 1901. There is also a Charles Hornblower, Shoeblack born circa 1893 Limehouse. He was at the Shoeblack Society, Saffron Hill. Not far from Leather Lane & Beauchamp St.
Could this be a false reference? It says WGH has been employed as Grocer's Asst for 4-5 years but WGH gives his occupation as Town Carman. 40 Anthony St. Can't see any family connections 1901 or 1911. 14 Brunswick Place. Occupied I think by the Little family etc 1911. There is a 14 Brunswick Pl. Stepney and another in Shoreditch. 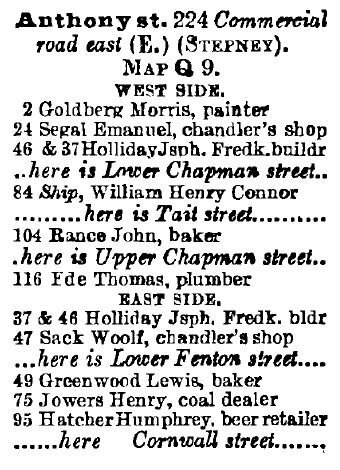 They all appear to be real addresses but with no obvious connections- there was an Eliza Hubbard living at Anthony St (don;t know which number) in 1891 but she's unmarried.I found a number of Hornblowers but the nearest one to a grocer was a tea dealer's assistant or somesuch- I think he was in Stepney. It is possible that the Leather Lane address was a business address only and that the Hornblower in question lived elsewhere, someone found a boy's home at 11 Beauchamp. I agree that the occupational stuff is rather strange an there is that possibility of it being a fake or at least very suspect reference. Was it usual for army recruits to provide a reference ? I have given all the known addresses for Robert Hubbard from 1890 to 1902 in my post above - unfortunately there wasn;t a listing for 1891 but they were probably at one of the addresses spanning that year. He is certainly a man of mystery. Has anyone been able to check out those earlier join up details? for a WG H joining up in 1908? an again in 1914? From 1893 through to 1901 Robert Hubbard was registered on the electoral roll as living at 79 Lower Chapman Street. I found it on Google maps and had also looked up Lower Chapman but idn;t realise Anthony St was longer back then. If Anthony St an Lower Chapman abut maybe we have our link for the address and the source of at least some of the confusion? Not entirely sure what's been covered and what hasn't. 40 Anthony Street in 1891 has a Fanny (or Hanny) Habbard aged 68. Sister of the HOH Maria Everfield aged 66. Both apprently born in Cambridgeshire. It's a house of multiple occupants, 3 families & 1 boarder. 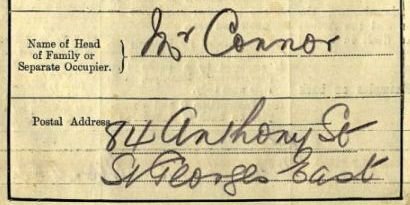 I still can't understand why William George's father's name is given as Robert Hubbard, 40 Anthony Street, Stepney on his service papers when he died in 1901 and his address then was Sheridan Street. Just realised in my last post I said the family were all together at Sheridan Street in 1911 - I should have put 1901. Your Harvard map is from 1814 and there was considerable development in the following century. The area in 1916 is below. The red marker is on the approximate position of 40 Anthony Street. The part of the street north of Lower Chapman Street (modern Bigland Road) was no longer known as Catherine Street - the whole street from the junction with Commercial Road southwards had become known as Anthony Street. I said above that Anthony Street terminated at its south end at Upper Chapman Street (modern Chapman Street) - a more careful read of the map shows this was WRONG! In fact it continues another 75yds through a bridge under the railway all the way to Cable Street. Apologies. Lower Chapman Street is a little to its south. Jane Street is parallel and the next street to its west. Sheridan Street continued eastward (roughly) the same line as Lower Chapman Street (modern Bigland Street) beyond Watney Street (S end unchanged, N end now modern Watney Market) and the slight 'joggle' of Dunch Street (unchanged). It n longer exists, but was parallel to Tarling Street (unchanged) and the next street south. The second map shows this, but it is not as clear as I had to zoom out to catch it. Wider, but less crisp, view showing the whole of Sheridan Street to the east as well as the southernmost 75yds of Anthony Street cropped off the map above. I'm still working on pinpointing some of the other streets. It would be very useful if one of the Pals who's been closer to the action in this topic could give me a shopping list of streets needing finding! Hard to spot them scattered all over the thread. sI foun a later map- 1894- ot as detailed as the above. I think it's now pretty clear that the family didn;t move as much as the street addresses seem to show. In 1890 electoral roll shows Jane Court which is 1 Jane st.
so 1889 Jane Street , from at least 1892 Lower Chapman, 1901 Sherian.- which I found for myself before I got round to reading Mark's post above-at the far end of Lower Chapman. Remember that house numbering was not the postman friendly afair that it is today and that the census enumerator faced with a row of unnumbered houses would just assign numbers if they had to. FMP has an adress listing for Jane court (three properties) for 1891 but I can;t get past the index until I get to the library. I have checked out a number of the neighbours in Lower Chapman St in the 1891 and found some of them- I cannot find John Donovan reliably who is shown at Jane Court in 1890 (1889) as the other tenant (only two on the electoral roll are John Donovan an Robert Hubbard) or George Peet who is at 77 Lower Chapman in 1893 (1892). Interestingly the 1814 map shows the Sun Tavern had fields - presumably to collect livestock pre slaughter? Why do you believe this Meg? I have already placed the red marker on the approximate position of 40 Anthony Street on the map extract above. This was not done frivolously but based on trade directory evidence. What makes you so confident I am wrong and the address is on the Anthony St/Lower Chapman St crossroads? In 1915 Anthony Street was numbered evens on the west side, odds on the east. Numbering began at the north end at the Commercial Road junction. No 40 is thus 20 properties south of Commercial Road on the west side approx where I placed the red marker. Way short of the junction with Lower Chapman Street. Looking at Lower Chapman Street, odds are on the north side, evens on the south side, with numbering beginning at the west end at the junction with Cannon Street Road (sic). The junction with Anthony Street lies between numbers 38 and 40 on the south side, and 39 and 41 on the north side. No 79 is five houses east of Smith's Place (renamed as Agra Place on the map I posted above). In 1915 a pram maker called Hyman Cohen is trading from the address. This does not necessarily mean another family was not residing separately in the same building. This would not be unusual in this area in 1915. In my experience at looking at many Great War London postal addresses, the house numbering is generally pretty logical. Well if you were asked to number Anthony St TODAY- you would walk in from Commercial Street and start numbering using modern convention of odd down one side and even down the other starting from the corner- the street is now so short you probably wouldn't get past number 20. But here's the thing- if you were asked to number Anthony St in 1814 or any time up until Catherine St got a name change- it is still referred to as Catherine St in one map of 1880 you wouldn;t start at that end- you would start at Cable st and quite probably number sequentially up one side and down the other as can be seen on various census forms. Likewise- Lower Chapman St became Bigland St- it could well have changed numbering in the process. Why woul WG H give the address 40 Anthony for no good reason? He hasn;t made the address up, and why should we assume that he was lying, confused or mentally struggling at that pre war stage? he had nothing to hide so far as we know. It is perfectly feasible that he did in fact live at 40 Anthony Street which was on the corner of Lower Chapman and got renumbered as 79. That said- in 1890-1893 John Hurley is living at 40 Anthony, Martin Ryan at 42 and John Chappell at 38 (We know Robert Hubbard is at Jane Court Jane St in 1890) while we have Henry Isaac Arter 81 Lower Chapman (long term resident) 77 empty. Ie we have both addresses showing as distinct in 1890 (1889) - but if it was on the corner it could well be that the one building was known as 40 Anthony st or had an entrance on Anthony street even though the family officially lived at 79 Lower Chapman. It works very nicely to explain the issues of that strange address. 1902 we have Jeremiah Hurley at 40 Anthony, Martin Ryan still at 42- but nothing listed between 20 and 40. Humfrey Hatcher has the pub at 95 Anthony St from 1898 onwards- if it is the same PH shown on the corner of Anthony and Tait (Ne Chapel) street then I would agree that it would put 40 closer to your red mark- the only other pub is shown as 84 but only one is marked on the map- it is on the west side of the street so 84 is more likely. Of the other people in the directory of 1915 in 1911 the only ones to be found as voters are Emamanuel Segal, Albert Lawrence and Humfrey Hatcher. There seems to be quite a change in character of the street over the years from mostly residential to more commercial properties and there are more immigrants. Some of the names from the directory show up as living (above their premises?) on Lower Chapman- Wm Hudson, Woolf Greenstein, Thos Whalen, Ralph Whalen, Geor Edw Tipler (long term resident), Louis Cohen are all there in 1912. I have no oubt that number 40 Anthon was eaxactly where you inicated in 1950- but can webe sure that that is where it was in 1890 or so? An what other explanation is there for Wg H giving this address? The map may well be very accurate in terms of numbering in 1950 but that does not mean that the numbering in 1950 is the same as it was in the 1890's . There have been so many road name changes between 1894 and 1916 that it is difficult to keep track (I note that in 1902 Agra place is shown as being off Upper Chapman Street in the electoral roll whikle being off Lower (or Bigland) on the map- it is very easy to see where confusion could occur. In the 2ndApril 1911 census there is a Harry Abbott of the right age (25 yrs) from London Middlesex with the 1stbatt Princess of Wales Own Yorkshire Regiment who are stationed overseas (Egypt, Sierra Leone, Sth Aftrica & Sudan). He is single and a drummer. I have found a Brunswick ROAD - parallel to Christian Street between Fairclough and Ellen between Whitechapel nd St Georges in the East- in 1890 there are only two voters registered- at number 13 and number 20. I haven;t found any references to any voters in later rolls. There is a George Frederick Hornblower married to an Annie P M but he is in Essex by 1901- b 1837-40 - has a son GF Hornblower in 1871 who disappears. Geo Fred claims to be retire bank clerk in 1901 , ied 1916. But he has a Holborn connection. A Geo Fred H ornblower is in Holbron electoral roll 1890 but gone by 1900. Elizabeth Maria Hubbard baptised 1st October 1876 at Christ Church, Watney St, Tower Hamlets, Father Richard Samuel a drover, living at 12 Umberton St.
Matilda Alice Hubbard baptised 10 Jan 1886, Whitechapel St Jude. Father Richard Samuel a drover, living at 3 New Castle Place, Whitechapel. William George Hubbard, baptised 16 October 1887, born 25 August 1887, Holy Trinity Minories, Tower Hamlets, Father Richard Samuel a drover, living at 36 Haydon St.
Mary Beatrice Hubbard, baptised 5 May 1889, Holy Trinity Minories, Tower Hamlets, father Richard Samuel a cattle drover, living at 49 Church St. These baptisms are from the original parish records on Ancestry. Just where is the name Abbott coming from?? Elizabeth is born in the Jane St/ Anthony St area- can;t find Unberton St at the mo but here is the parish. Then they move Sw a bit to the minute parish of Minories- an even there they move- there are only two residential streets showing in Holy Trinity- Church St and Haydon St and they manage to have a child born in each street!. Then due east to the Christchurch parish where they started from where they stay until Robert's death. NB- they baptised Elizabeth MARIA but registered Elizabeth Theresa? Could Elizabeth Theresa Abbott mothers name Poole not be the older sister after all? I like the misheard Hubbard for Abbott theory seems quite possible - maybe was a family joke so that's why he chose it? Interesting, but would William George Hubbard change his name to Harry Abbott and join up in the same regiment he was discharged from in 1912. Only found two Harry Abbotts with the Yorkshire Regiment with medal cards - one born Bradford kia 23/7/1916 and the other missing and presumed dead 17/8/1916 was born at Pudsey, Yorks. One possible explanation for the baptism/registration difference, is that the vicar already knew the family, so baptised them with the name they were using. As I understand it, the birth registration follows a more arms-length process, involving one parent (illiterate?) presenting at the Register Office. Humfrey Hatcher﻿ has the pub at 95 Anthony St from 1898 onwards- if it is the same PH shown on the corner of Anthony and Tait (Ne Chapel) street then I would agree that it would put 40 closer to your red mark- the only other pub is shown as 84 but only one is marked on the map- it is on the west side of the street so 84 is more likely. Crikey Meg - you are a difficult person to convince! This was the Railway Arms aka the Railway Tap - the pub marked on the maps on the east side of Anthony Street on the north corner of the junction with Cornwall Street. In the 1915 trade directory I already posted above, this is the premises of Humphrey Hatcher, beer retailer, viz. 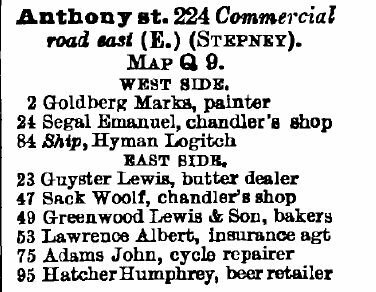 Going back to the 1882 trade directory, we see Adrian Benedict at 95 Anthony Street and listed as Beer Retailer, viz. Again, the location lies between Lower Fenton Street (later Mariner Street) and Cornwall Street. It is clearly the same address. 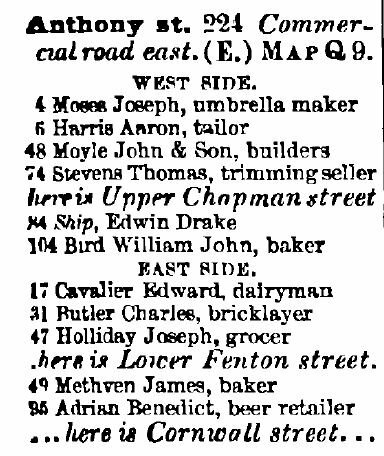 Adrian Benedict is shown as Beer Shop Keeper at 95 Anthony Street in the the 1881 Census, viz. The location is within Registration district: St George In The East; Sub registration district: St Paul; ED:19. This confirms that in 1881 95 Anthony Street lay on "the east side of Anthony Street from Upper Chapman Street to Cable Street". On the 1950's mapping, the pub has exactly the same numbering as in 1881. Obviously the house numbering in 1814 is likely to have been different, but do I need to go further back than 1881 to convince you that No 95 Anthony Street was exactly where I am claiming? For further information, there was another pub close by in Anthony Street - The Wheatsheaf. This was two doors further north of the Railway Arms on the other side of the railway bridge and on the SE corner of the junction of Anthony Street and Upper Chapman Street. Its address was 38 Upper Chapman Street. This was The Ship - the pub marked on the maps on the west side of Anthony Street on the northwest corner of the crossroads with Tait Street. In the 1915 trade directory, this is listed as Ship, run by Hyman Logitch, viz. Going back to the 1882 trade directory, we see Edwin Drake at the Ship, 84 Anthony Street, viz. The directory does however name the cross street as Upper Chapman Street in error for Lower Chapman Street and the crossing with Tait St. is omitted altogether. I do note however you mention above that Agra Place is listed as opening off Upper Chapman St in the 1902 Electoral Roll. It may be possible that Lower Chapman St had a short spell as Upper Chapman St. 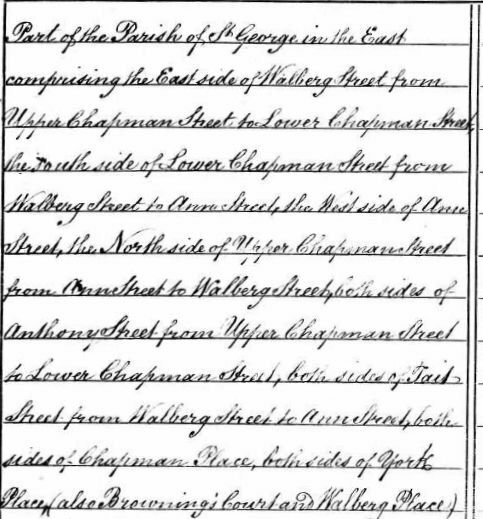 The 'real' Upper Chapman St is now known as plain Chapman St.
Edwin Drake is shown as Licensed Victualler at 84 Anthony Street in the the 1881 Census, viz. The location is within Registration district: St George In The East; Sub registration district: St Paul; ED:17. This confirms that in 1881, 84 Anthony Street lay on Anthony Street between "the south side of Lower Chapman Street" and "the north side of Upper Chapman Street". In other words No 84 cannot be any further north than the SW corner of the Anthony St./Lower Chapman St. crossroads. 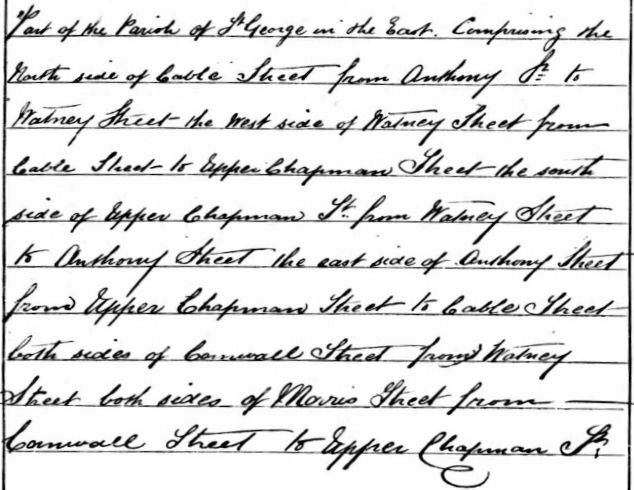 The schedules of the 1881 census however go in sequence southwards down the east side of Anthony Street from Lower Chapman Street (40 Lower Chapman St) to Upper Chapman Street (91 Anthony St), then southwards down the west side of Anthony Street in the same range (38 Lower Chapman St to 14 Upper Chapman St). Exactly the same house numbers fall in this section of Anthony St on the 1881 Census as are shown on the 1950s mapping. The house numbers going N-S in Anthony Street in this range are - West side: 76 to 104; East side: 61 to 91. 79 Lower Chapman Street is not in ED17 at all, but in ED11. 79 Lower Chapman Street lies on the north side of that street just E of the junction with Mary Street and six doors E of Smith's Place (aka Agra Place). This is ~100yds E of the Anthony St/Lower Chapman St crossroads, 150yds from The Ship pub, and 200yds from 40 Anthony Street. well I'm glad we can finally agree that the pub shown on the map is NOT 95 but 84! I cannot find Robert in the electoral rolls for Tower Hamlets for the roll years 1891 and 1892, I haven't checked other Boroughs because it seems unlikely that they moved far away (plus I'd have to check all those other Robert Hubbards out in the other years as well ;-) ). Only explanation I can think is that Robert became financially embarassed and they had to take lodgings rather than a house an so didn't meet the L10 a year criteria. Doesn;t explain why they can;t be found in 1891 census. 40 Anthony is occupied by John Hurley through those years with John Chappell at 38 an Martin Ryan at 42. I don;t have access to the images but there doesn;t seem to be a lot of space there for an unindexed Hubbard family to be living with any of those? I have also checked out the Peek and Wilderspin families up the road (46 , 48) and the Cray and Sage (NB SUGE in 1891) families down the road (30 and 34)- there s a gap in the census pages here so there are people not showing on the electoral roll to fill in on the 1891 census- are the Hubbards hiding in here anyone? I am only working from the family search index and can;t see the actual images. There is also the Jane Court address to check out where they were in 1889 and Lower Chapman where they were in 1893. I really can;t see why he would make this up, fudge the truth if he was trying to get in when he thought he would be rejected for some reason- yes, make it up? why ? there has to be some connection here. I'm happy to help with London geography, and the Rifle Brigade connection once it is clarified. I'll leave the theorising to others. If a list of the missing addresses could be posted, I can have a stab at locating them, but they're all too diffusely spread in the topic for me to find them myself. Jane Court - Robert is a voter here in 1890 roll- I have checked the 1891 census and there are three families at Jane Court NONE are Hubbards- McCarthy, Vickers an Stone families, Jane Street seems to be mostly Russians and Poles of Jewish heritage. Jane Court has been listed after Richard St so presume it is tucked in between the two Streets somewhere. Fanny Malden m Henry Hubbard 1850 Horsleydown- Henry son of Henry, Police constable from Huntingon, in 1851 they are in Rotherhithe with 4 year old son William J (!) he was born in Cambridgeshire so suspect he is Fanny's son pre Henry. Maria Malden is possibly in Huntingdon in 1841, is a servant in Kent 1851, she married Thomas Eversfield in Greenwich 1859, lodging in 1861 st geo in east, widow with her daughter Eliza and nephew William Malden (Fanny's son?) and nephew Willaim Malden b Scotland in 1871 in St Geo in E, with nephew William Jno Malden in Mile end in 1881. 1891 I think William Malen is the entry above Maria at 40 Anthony St.
79 Lower Chapman street is unoccupied. Robert, having got over his initial youthful exuberance has been providing adequately for his family for some years but falls into temptation an goes away again meaning the missus and kids go into the workhouse- an for some reason we can;t find them in the indexes (only initials used on the forms? ) , Or same scenario except it's ill health or injury that puts them in the workhouse. That is the better option because option number two is that the family decided that moving day was going to be census night- they are shifting house that day and the census forms never got filled out! We do have a possible Hubbard link to 40 Anthony Street though with F/H/J anny living there.I'm going to try and follow her up. Attestation form shows - William George Hubbard of Stepney, signed up at London on 4th Sept 1911 claiming to already be in the 5th Middlesex (stamped special reserve), for the Yorkshire Regt. Apparent age- 18 7, height 5 2 1/4 (he's pretty short! ), weight 116 lbs, fresh complexion brown eyes and hair (this rules out him being some of the earlier recruits that I thought he might be). He has a scar outer side left orbi (sic- tear on page) an a pulse of 92 which is quite high for a resting pulse in a fit young guy. 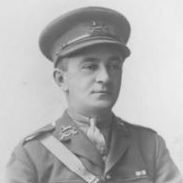 Despite the medical officer certifying that they had taken all due care in certifying him fit he didn;t last long with his regiment. He was signed in at Richmond on the 5th Sept 1911 , posted to the 2n Btn 16th 9 1911 and discharged unfit on the 15th of November 1912 with that comment "neurasthenia"- home service. He is noted as being 3rd class at Mill hill 21/7/1911 "while still with Special Reserve"
He has given father as Robert Hubbard of 40 Anthony Street in the next of kin box ! Susan listed details from another form she found which gave 12 Beauchamp Street as home of NoK Arthur Hubbard- I haven;t been able to find this- ancestry has a form only available through Fold which it won't let me look at- not sure what this form is. 18 7 on attestation would give a birth date of Feb 1893, 20 9 on discharge would give a birth date of Feb 1892. I'm guessing a stuff up either when he signed up or was discharged on the part of those filling the forms in? Is there any way of finding out about that previous service with the 5th Middlesex? Some speculative thoughts here- I know speculation but we are having to get inventive with this guy. A wee while back there was a thread where it turned out that a younger brother had used his older brother's name to sign up under age. Then when older brother joined up he used a different first name entirely. Could we have something like this going on here? Suppose- The William George who joined up in 1911 is not , in fact William George, or the son of Robert ? But he uses (probably uncle?) Robert's name as his father's to throw the scent off when he joins up , and guesses the address- when he is discharged he uses dad Arthur's name as it doesn't matter anymore? Then when the REAL William George wants to join up he does so under the assumed name of William Henry Abbott because he knows cousin whatever used his name. Why he picked Abbott ? who knows. 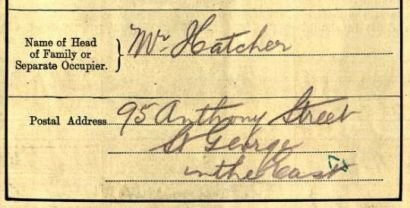 Arthur Frederick, brother of Robert Samuel had a son also Arthur Frederick b 1893, For William George's we only have one b in Islington in 1893 and St Pancras an Poplar 1891- none of which match our WG joining up in 1911. Arthur Fred is with his parents in 1911- he is a cattle drover not a carman. There seems to be an awful lot of speculative possibilities going on here which I don't think are helping the OP. Here's the 12 Beauchamp St in context. ancestry has a form only available through Fold which it won't let me look at- not sure what this form is. There are 63 William Hubbards WFA pension cards in Fold3. None in London or Bristol. There are two Abbotts in Bristol but no Harrys. He was discharged 15/11/1912 having been found medically unfit for further service. Apart from him saying he was a soldier and mentioning 3rd Rifle Brigade in 1918 so far there's been no WWI context. As he seems to be giving bogus addresses and parents in 1911 before his 'serious brain concussion'. If he joined 1914-1915 I'd say he must have lied again and made up a third name. Not sure if he may have come up for conscription at some point or if his 1912 medical discharge let him off. I think this may be the pension record, that is for the William George Hubbard enlisted to MIddlesex Regiment and then moved to Yorkshire Regiment. The only form I could access was one dated 4/9/11 which states he is already in the 5th Middlesex special reserve- this form is him going on to join the Yorkshire Regt. 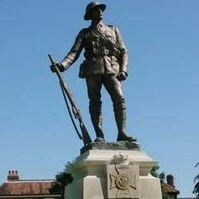 It gives no details of his time in the Middlesex regt. The only NoK given is Robert of 40 Anthony St, the Beauchamp st address does not appear on the form I can access, only the 14 Brunswick place address in the discharge notes. There is no mention of Arthur on this form. I have provided all the information given on this form above. The form I can access also has no mention of the mysterious Mr Hornblower. As I note above I am speculating regarding a previous thread where an underage boy gave his older brother's name at attestation and the older brother then used a false first name when he joined up. I am therefore positing the POSSIBILITY that something similar has happened here and that a son of Arthur has joined up against his family's wishes using his uncle Robert's (incorrect) details. It makes as much sense as supposing that he was released from a mental asylum to join up or that he didn't know his father's address or his own age. If no one was prepared to speculate we would still be looking for a William Harry, in Poplar. I don;t see a need for any third name. Where does the "serious brain concussion" come in? The attestation and discharge papers from the Yorkshire Regt only mention neurasthenia. Hope someone can see it! Personally I don;t see why this man would even be entitled to a pension on the records we have so far. Neurasthenia would be an illness surely? rather than something pensionable?? I'm thinking the pension that gave his wife problems later on is issued to Harry Abbott ? An illness could be pensionable - pension levels were rated on a disability level of 0% to 100,based on amount of disability, but they were also looked at on the basis of whether they were attributed to or aggravated by service. When I said a list, I really meant a list rather than a small novel! It's the impenetrability of the posts in this topic that's made it too onerous to plough through them looking for addresses to locate. I've already accurately located #3 and #4. #2 is simple: parallel to northern half of Anthony Street and two streets westwards. #1 must be off Jane Street - I'll try and pinpoint where for you. #5 and #6 I'll also hunt down. Any more addresses? Ideally with house numbers included. Earlier I looked up Harford Street and Emmott Street, both approx a mile to the NE in the Mile End/Stepney Green area just west of the Regent's Canal. If these two addresses are now out of play, then I don't need to post my results for them. Let me know (briefly). TEW - I completely 100% agree. I am very happy to help locate factual addresses, but please leave me out of the theorising. Andy and I are watching this topic because eventually there may be a specific Rifle Brigade question.